Most of the present separation techniques used to eliminate very dilute concentrations of pollutants from water tend to be energy and chemical intensive. An MIT team has developed a new technique that could provide a selective alternative for eliminating even very low levels of undesirable compounds. The new method is illustrated in the journal Energy and Environmental Science, in a paper by MIT postdoc Xiao Su, Ralph Landau Professor of Chemical Engineering T. Alan Hatton and five others at MIT and at the Technical University of Darmstadt in Germany. The system uses a unique technique, depending upon an electrochemical process to selectively eliminate organic contaminants such as chemical waste products, pesticides and pharmaceuticals, even when these are present in small yet unsafe concentrations. The method also looks at major limitations of conventional electrochemical separation techniques, such as losses in performance and acidity fluctuations that can occur due to competing surface reactions. Existing systems for handling such dilute contaminants include membrane filtration, which is costly and has minimal effectiveness at low concentrations. Also used are electrodialysis and capacitive deionization, which frequently require high voltages that tend to create side reactions, according to Su. These processes also are hindered by surplus background salts. In the new system, the water is made to flow between chemically treated, or “functionalized” surfaces that act as positive and negative electrodes. These electrode surfaces are coated with Faradaic materials, which can endure reactions to become negatively or positively charged. These active groups can be adjusted to bind strongly with a particular type of pollutant molecule, as the team showed using various pesticides and ibuprofen. The MIT researchers discovered that this process can successfully eliminate such molecules even at parts-per-million concentrations. Earlier studies have typically focused on conductive electrodes, or functionalized plates on just a single electrode, but these repeatedly reach high voltages that create contaminating compounds. By using suitably functionalized electrodes on both the positive and negative sides, in an asymmetric configuration, the team almost totally excluded these side reactions. Also, these asymmetric systems allow for simultaneous selective removal of both positive and negative toxic ions at the same time, as the team proved with the herbicides quinchlorac and paraquat. The same selective approach should also be applied to the recovery of high-value compounds in a pharmaceutical or chemical production unit, where they might otherwise be wasted. The system could be used for environmental remediation, for toxic organic chemical removal, or in a chemical plant to recover value-added products, as they would all rely on the same principle to pull out the minority ion from a complex multi-ion system. In contrast to membrane-based systems that demand high pressures and other electrochemical systems that function at high voltages, the new system functions at comparatively benign low pressures and voltages, Hatton says. And, he highlights, unlike conventional ion exchange systems where release of the captured compounds and regeneration of the adsorbents would necessitate the addition of chemicals, “In our case you can just flip a switch,” to accomplish the same result by swapping the polarity of the electrodes. The MIT research team has already received a series of honors for the ongoing development of water treatment technology, including grants from the J-WAFS Solutions and Massachusetts Clean Energy Catalyst competitions, and the researchers were the top winners of last year’s MIT Water Innovation Prize. The team has applied for a patent on the new process, “We definitely want to implement this in the real world,” Hatton says. In the interim, they are focused on scaling up their prototype devices in the lab and refining the chemical robustness. 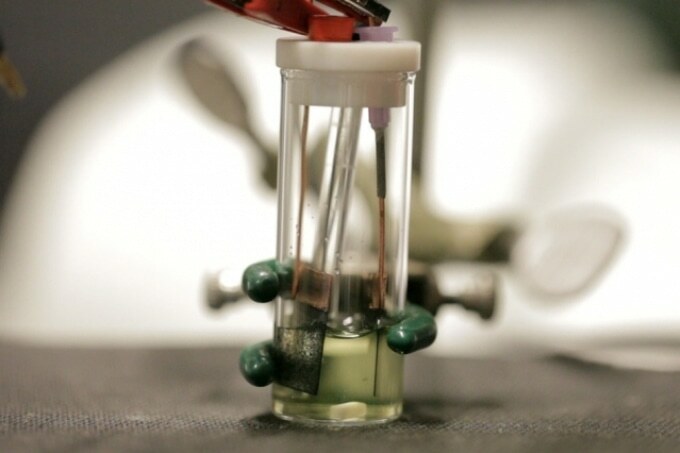 Is highly significant, as it extends the capabilities of electrochemical systems from basically nonselective toward highly selective removal of key pollutants. As with many emerging water purification techniques, it must still must be tested under real-world conditions and for long periods to check durability. However, the prototype system achieved over 500 cycles, which is a highly promising result. The team also included Kai-Jher Tan, Johannes Elbert and Robert R. Taylor, Professor of Chemistry Timothy Jamison at MIT; and Christian Ruttiger and Markus Gallei at the Technical University of Darmstadt. The work was supported by a seed grant from the Abdul Latif Jameel World Water and Food Security Lab (J-WAFS) at MIT.